The Multicultural Center was renamed the Multicultural Student Services Center yesterday. The event began with a speech from Director of the MSSC Melvin Wade, followed by M.U.S.I.C. speakers chairman Luckson Omoarogba, and President Dooley himself among others. When asked prior to the event about the renaming of the MSSC, Wade noted that student organizations are an under-tapped resource and stressed the importance of involvement in those student organizations. He said that one of MSSC’s goals is to support these programs and the students who run them. Newly appointed Assistant Director Karoline Lopes continued this idea of the MSSC, providing support for its students. Lopes added that the reason for renaming the MSSC was to “align the center’s name with its purpose, which is to service the students.” Lopes talked about the tremendous value of having a space where students can come together, to learn and share their differences. The student-orientated mission of the MSSC creates a welcoming environment where students feel safe and empowered. Lopes has made many efforts to help students, and Wade agreed that she was “head and shoulders” above the rest of the assistant director candidates. He also mentioned the importance of adding a staff member and presenting that staff member to the university. The position had been vacant for about a year and a half before Lopes was appointed. In just a few months, she has been able to make many improvements to the building that have helped attract more students. 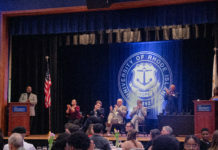 Some of these achievements include helping to create a computer room in the lower level of the building, installing a brand new, 52-inch smart TV in the second floor DeMoura Lounge, as well as a new sound system in the Hardge Forum, and many more. President Dooley concluded the event with a speech geared toward commemorating all of the students and faculty who created this foundation for future students, and also commending those who work now to make it better. “The future starts now, through the new name and with our new assistant director,” Fontes-Barros said. She was present when the Multicultural Center was created in 1992 through the Black Student Leadership Group. Fontes-Barros met with the president of their time, Robert L. Carothers, in his conference room and gave their demands for a student-orientated center. Now, 24 years later, the MSSC still stands and continues to provide support to the students of URI.